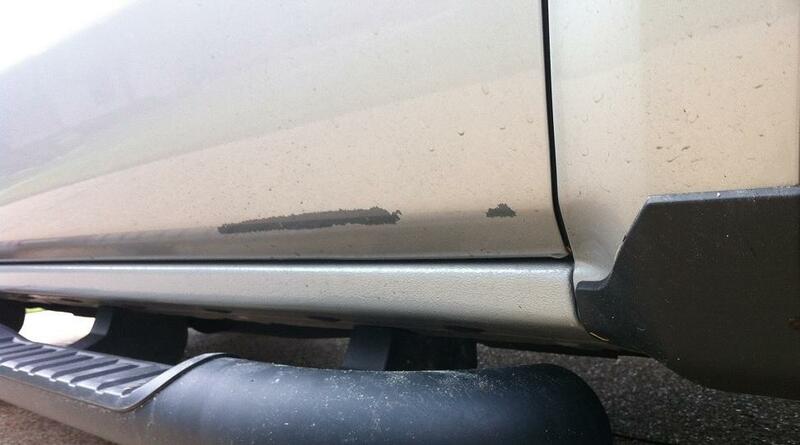 Be sure to keep a close eye on the bottoms of your doors and fenders which have chip guard!! This also applies to the 2014 GMC Sierra - so if you know anyone who has one - advise them as well. Chevrolet/GM are keeping this quiet to limit repairing a lot of trucks. It is difficult to notice and even the Rep had a hard time finding it (when he knew about my warranty claim and supposedly has researched the history - aka, there's a picture in the Service Bulletin). Our 2014 Silverado was roughly 16 months old with 10,000 miles when we first noticed a chunk of paint missing from the bottom of the passenger door (roughly the size of a nickel or dime). At first I thought something had hit it to chip the paint off but close inspection showed all the primer was perfectly intact and there was no door ding or dent in the area. We have side steps which help protect from rocks and there is the “anti-chip” paint treatment just below it this area (isn’t that odd, the paint chips away from the “anti-chip” area). After observing things for awhile, the area was getting larger and larger and about the only thing I can think of is just normal car washes and drying it off is causing more little chips of paint to fall off. This vehicle doesn’t go off-road or travel any dirt/gravel roads. I did some research and found out about PIT5313A (although the latest version is now PIT5313C). So I go to the dealership where we purchased the truck and to the body shop manager. He comes out, takes a look at it and states that he’s seen a few trucks with the same issue and they repainted roughly the bottom 1/3 of the door. I asked if it was always the passenger front door and he said no and went on to mention that he did one truck and the guy was back about 3-4 months later with the same issue on a door on the other side. I continue walking him down this road. Do you know what was causing this problem on his truck? Nope, just repaint the lower portion of the door and sent him on his way. Do you have any theory on why the primer is perfect but the paint is chipping away? Nope, maybe it is just getting sprayed too thin (which, as a side note, I’d agree with because the thickness of the paint/clearcoat is really thin). I express my concerns that just painting the lower portion of my door doesn’t mean I won’t be coming back several more times as other doors start peeling. I didn’t spend ~$42k for a truck that needs it’s panels repainted on a regular basis and what am I supposed to do when I get beyond the standard 3yr/36k warranty? Heck, I’m having too many problems getting this door fixed and it is within warranty! I fill him in on PIT5313, he looks it up and says that they are supposed to run 2” masking tape just above the “anti-chip” area and then pull it off quickly to see if the paint pulls off any of the other panels. Did he do that with the other truck which was in twice for repainting? Nope. He goes out to do this test on our truck and the other three doors don’t peel any paint. He and I agree about not being sure of the validity of this test without cleaning the area of all the stuff which may affect the masking tape from sticking (wax, grease, dirt, silicon, etc). He says they will degrease those areas and retest when the vehicle comes in to get the warranty work done. He agrees that PIT5313 calls for a full repaint of the door which would require blending into the fender/rear door. I explain that my concern is with the adhesion between the base coat and primer and that I’m concerned it isn’t limited to the just the small area above the “anti-chip” treatment (since I’ve seen how easily the rest of the vehicle gets rock chips compared to our previous Silverado). I also stated that since they require a full door repaint – this too indicates agreement that the paint integrity of the entire door is in question. I’ve seen no explanation to the official underlying cause and why/how the paint to primer adhesion issue is related to the “anti-chip” area and not the rest of the vehicle? My suspicion is that with time, a rock chip or a deep scratch and the paint will start peeling on any panel of the truck. He says there is nothing he can do/suggest and that I should have to call Chevrolet. Time to call a Chevrolet rep and you know this is a painful process. First call taker hits me with lots of useless questions before agreeing to transfer me to a Senior Representative. After holding on the phone for 20 minutes, she promises to call me back when she can get a Sr. Rep on the line because they are experiencing very high call volume (that’s not a good sign! A company makes the most money when its’ call center people have NOTHING to do). About 1.5hrs later, I get a call back and am connected to the Sr. Rep. He gets a basic run down of the situation and asks why I’m not satisfied with the dealerships offer to repaint the door under warranty? I indicate that I can’t explain or negotiate what will make me a “happy customer” without talking to someone who understands the underlying cause of the paint peeling. Without knowing the cause, I can’t know whether it’s been fixed or if the repaint won’t stick any better than the factory paint – i.e. I’m only getting a temporary fix until it starts peeling again (which I’m sure they’re hoping is after warranty runs out). He doesn’t understand my concern and I ask him if he knows when my truck was built – yes, he does Dec ’13. I ask him if he knows where it was built – no he doesn’t. He wasn’t able to correlate the Z designation in my VIN to Ft. Wayne, so I provided that info. I ask if that helps him any with understanding my problem and it doesn’t. I tell him to look up PIT5313C and he can’t find anything in his system! Apparently, the onus is on the customer to research problems with their vehicle, capture that data, bring that data with them to the dealership and/or when they call Chevrolet/GM and educate their representatives on known issues with their product. I can’t believe GM’s Customer Service Reps don’t automatically have access to all recalls, bulletins, service notes related to each VIN for a call case they are working. When they open a case #, the VIN should be used to populate tabs which would allow them to quickly and easily assist the customer with information from their knowledge base. Whether they are organized by recalls, bulletins, service notes brakes, engine, interior, paint, etc is an implementation decision. He’s going to give a call to the dealership’s Customer Experience Mgr and have him get in touch with me to see what we can work out for a resolution. I honestly have no expectation of satisfaction or being a happy Chevrolet customer again. Sorry, back on topic … if they only paint one door panel, then, at a minimum, I need an extended warranty just for “paint peeling” to protect us past the basic 3yr/36k miles. I’m pretty sure that this thin paint will peel away from the primer on any/every panel of the truck. The wife thought she’d love this Silverado as much as her last one, for 8yrs/65k miles but it isn’t looking good. I was promised either the Chevrolet Customer Rep or the Customer Experience Manager from the dealer that sold us the Silverado would be in touch by Wednesday, 11/4. Called Chevrolet Customer Service on 10/30 to create case #. Called back on 11/4 – haven’t heard anything back. Called back again on 11/5 – haven’t heard anything back. Still haven’t heard anything and it is 11/15. Does anyone think GM, Chevrolet or the Dealership even care? Sure could use some help from someone who understands how this “paint peeling at the ‘anti-chip’ area” phenomenon, how it is affecting customer satisfaction and loyalty. I’m having flashbacks to the paint peeling of the 80’s/90’s. i have been battling better biz and gm about this prob.they are in cahoots,for one.for 2 they just keep asking for more useless info hoping i go away,then call me and say they are" closing out this complaint"when nothing is resolved. we need to stick together or lose.how does this (and other forums) help us get action?? i will post my email if i need to.we need to start a petition or something to put on pressure. one at a time at a [non-permissible content removed] session probably makes them laugh!! I have a 2014 Silverado LT, 80,000 miles. Truck is well maintained. I have paint peeling right rear door and front right fender. Dealer and GM both told me it is out of warranty and my problem not theirs. We tried to fix it and the more we paint and use masking tape more paint peels off. I have owned with my Sons 17 Chevrolet vehicles, never had a paint issue. Looking in to starting a class action law suit, if interested please contact me. GM is totally at fault, these vehicles were not painted properly. This comment comes from my dealer.